Apple's Q3 2013 results beat analyst expectations even as it reported flat revenue and a second consecutive quarter with a decline in earnings. iPhone shipments of 31.2 million were far higher than estimates (including mine) and the 14.6 million iPad shipments came in far below estimates. While the results were within Apple's guidance range, the accompanied ASP decline across the board and weakness in all non-US markets (especially emerging markets) are cause for concern. As the chart above shows, iPhone shipments remained surprisingly strong with a YoY grpwth of about 20% and a lower than expected sequential decline of 17%. Meanwhile, iPad shipments dropped by about 14% sequentially and by about 25% YoY because of a combination of increasing competition and the lack of an iPad product launch in Q2. 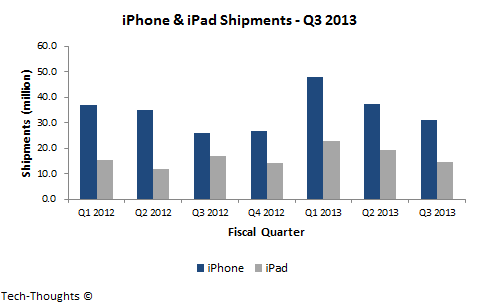 On the earnings call, Apple mentioned that both iPhone & iPad inventory were drawn down in the quarter. This meant that actual sell-through was slightly better than the numbers suggest, but the overall trend remains the same. At first glance, these results look extremely positive for Apple, but a deeper look reveals some worrying signs. Let's begin by taking a look at ASP trends for the iPhone & iPad. Up until the last few quarters, the iPhone's ASP had remained remarkably stable thanks to carrier subsidies and Apple's pricing policies. However, since the iPhone 5 launch, the ASP for the product line has declined sharply by 10%. This is curious as Apple has not made any changes to its product portfolio or price points. This suggests that the ASP drop can either be attributed to promotional pricing (unlikely to be passed on to Apple, at least in subsidized markets) or a major shift in the sales mix to older iPhone models. 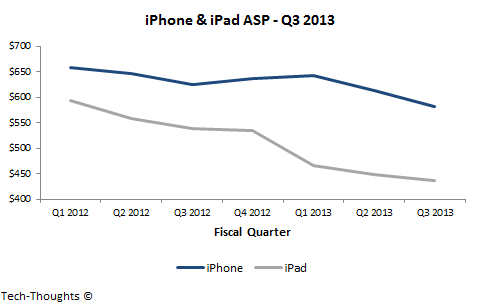 In comparison to the iPhone, the iPad's ASP has been less resilient. This isn't really a surprise as there are no carriers to shield the product from price competition. Since the iPad Mini's launch, the ASP for the product line has declined by a staggering 19%. As I showed last quarter, the consistent drop in ASP since the iPad Mini launch suggests that the sales mix has been shifting towards the iPad Mini, i.e. the sales of the full-size iPad have seen consistent sequential declines thanks to cannibalization. Since iPhone sales are responsible for over 50% of Apple's revenue, the revenue split by region gives us a fairly accurate representation of the split of iPhone sales. 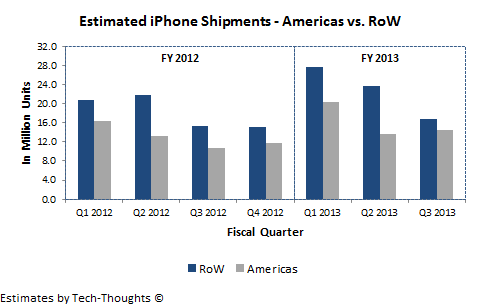 As the chart above shows, Apple's surprising iPhone shipment performance in the quarter was driven exclusively by the Americas (the US market may be a more accurate representation). iPhone shipments in the Americas actually grew by 5% sequentially, while shipments in the rest of the world declined by nearly 30%. The 30% decline in the rest of the world was in line with my expectations, while the 5% growth in the US was a complete surprise. This was most likely partially driven by pricing promotions at major US carriers and may not necessarily be indicative of a future trend. The data suggests that iPhone's already tenuous position in emerging markets could be slipping, particularly in Greater China, where Apple saw a 43% sequential decline. The APAC region, excluding Greater China, also saw a sequential decline of about 35%. Putting all these data points together, it appears that Apple's strong iPhone performance was almost exclusively driven by the US market, with very weak performance internationally. Japan and the UK also showed growth comparable to the US, but the decline in other international locations more than made up for those gains. Despite Tim Cook's protests, the relatively strong sales performance of the "free" iPhone 4 in the US and slowing international shipments suggest that the high-end smartphone market is slowing. This also suggests that unless a "low cost" iPhone is priced aggressively in emerging markets, Apple is unlikely to make substantial gains. 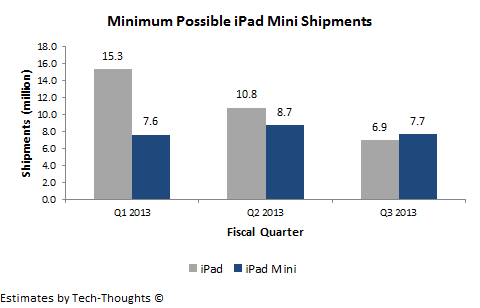 The chart above shows the minimum possible iPad Mini shipments, given the ASP and overall shipment figures. Using a full-size iPad ASP of $520-$535 and a minimum iPad Mini ASP of $360 gives us iPad Mini shipments of roughly 8 million units and full-size iPad shipments of 6-7 million units. While shipments of the full-size iPad were certainly affected by the lack of a new product launch, it should be noted that the product was refreshed in October. Therefore, the fourth generation iPad is still within the bounds of Apple's usual product cycle. This suggests that price competition, both from the iPad Mini and other vendors, is taking a significant toll on the iPad. Recent rumors have suggested that Apple is likely to refresh the 9.7" iPad in September/October and delay the iPad Mini refresh to early 2014. Given the price expectations in the market, this is very unlikely to drive any sustainable market share recovery for the iPad. If these rumors are true, I would expect Apple's share of the tablet market to settle in at 25-30% by the end of the year.